A total of 3,570 enterprises started operations in the business economy in 2017, 15% less than in 2016 when they were 4,205. These enterprises’ combined turnover was by 15% lower than the turnover of enterprises that started operations in 2016, decreased from 54 billion ISK in 2016 to 46 billion ISK in 2017. The number of persons employed in these enterprises decreased by 25% from 2016 to 2017, from 5,300 persons in 2016 to just over 4,000 in 2017. The year 2016 had the highest birth rate, with an increase in most economic sectors. Tourism industries had the highest birth rate in comparison with other economic activities, between 12 and 18 percentage points in 2012–2017. 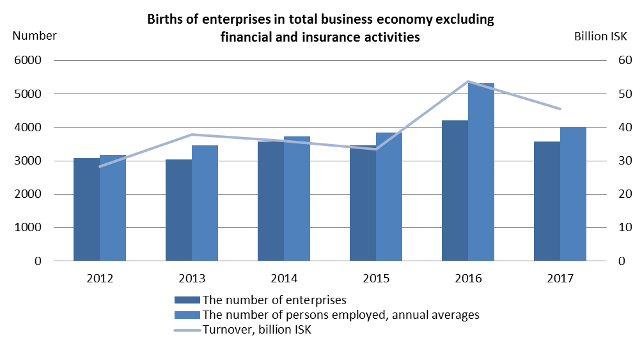 In 2017, most enterprise births were in construction, a total of 627 enterprises with 716 persons employed and a total turnover up to 9.35 billion ISK. The largest turnover was among enterprises that started operations in wholesale and retail trade or 16.21 billion ISK in 394 enterprises with 720 persons employed. Enterprises that started operations in tourism industries during 2017 had the highest number of persons employed, 740 persons at 524 enterprises with over 4 billion ISK in turnover. In spite of this, there was a contraction between years in tourism industries’ births, since there were 626 enterprises births with more than 1,300 persons employed and 8.66 billion ISK in turnover. Business Demography Statistics are based on Eurostat and OECD harmonized methodologies. Therefore, they are comparable to statistics in other European countries. The statistics are based on tax returns of enterprises and individuals. It covers the private sector except agriculture, financial and insurance services. Public administration, health and social services, educational activities, cultural, sporting and recreational activities, as well as NGO activities, are excluded. Enterprises are considered active when they have operating income or personnel costs. When operation of enterprise moves between identification numbers, it is not considered to be an enterprise birth unless two of the following three conditions are met; operation is in another economic sector according to ÍSAT2008, operation is carried out at another location or the majority of staff has been changed. Adjustments are also made in connection with mergers and split-offs. Amounts are at current prices. Notes: 1Transport (total); Accommodation, food and beverages; Renting and leasing of motor vehicles, recreational and sports goods; Travel agency, tour operator and other reservation service and related activities. 2Manufacture of chemicals and chemical products; Manufacture of weapons and ammunition; Manufacture of computer, electronic and optical products; Manufacture of electrical equipment; Manufacture of machinery and equipment n.e.c. ; Manufacture of motor vehicles, trailers and semi-trailers; Manufacture of other transport equipment; Manufacture of medical and dental instruments and supplies; Postal and courier activities; Publishing activities; Programming and broadcasting activities; Telecommunications; Computer programming, consultancy and related activities; Information service activities; Scientific research and development. Use of this press release is free. Please quote the source.